Player Unknown’s Battlegrounds (PUBG) lit the world on fire in 2017. It sold millions before it even left Early Access on Steam, and kicked off the battle royale gaming craze we’re experiencing right now. Not too long ago this FPS juggernaut landed on mobile. In PUBG you play as a mercenary who parachutes, along with up to 99 other players, onto an island. Once they land, players scavenge for weapons, ammo, armor, and other supplies in a last-man-standing death match. The game’s map starts large, but quickly shrinks as the electrical storm around the island collapses into progressively smaller circles, forcing players together as the game goes on. It’s a simple concept with tons of room for complexity. You land on an island with 99 other people and only your fists. Find a gun and stay in the circle. Last one standing wins. Is it worth playing? That’s what we aim to find out in this PUBG Mobile review. The Mobile version of PUBG has pretty much all the features of its PC counterpart, with a few exceptions. The game only offers PUBG’s original map, Erangel — an abandoned, vaguely Eastern European 8km x 8km island. Everything from the PC version of this map — from the abandoned military base to the burned out nuclear power plant — has made it to the Mobile version of the game. The mobile version of PUBG has pretty much all the features of its PC counterpart. All the weapons, gear, and vehicles available when PUBG first exited Early Access are here too. The guns it’s added since are absent, as is the game’s second map, Miramar. The game is totally free. You can login as either a guest or with Facebook to play. Gameplay and daily login rewards will earn your account experience and battle points, which can be spent on crates which contain a random piece of clothing for your character. Unlike in the PC version, you don’t start with any available clothing, but getting at least a pair of pants doesn’t take too long. Getting crates is pretty quick. The matchmaking works pretty quickly when queueing in squad, duo, or solo mode, though many of the options from the PC version are absent. Creating a private custom match doesn’t seem to be possible just yet. There’s a menu option for creating a “room,” but it appears to be for creating chat rooms, and also doesn’t seem to actually work yet. I never had to wait long to be matched with a squad, though connection issues were pretty common. Every team I played with had at least one player disconnect at the outset of the game. I never ran into any connection issues when I played, but at least one teammate was unresponsive in most games. The game has built-in voice chat, which works, though it feels like most players just use their phone’s speaker for a mic. If the mic is on the bottom of the phone, as is common, it can lead to some pretty annoying extra noise when players’ palms rub against it. 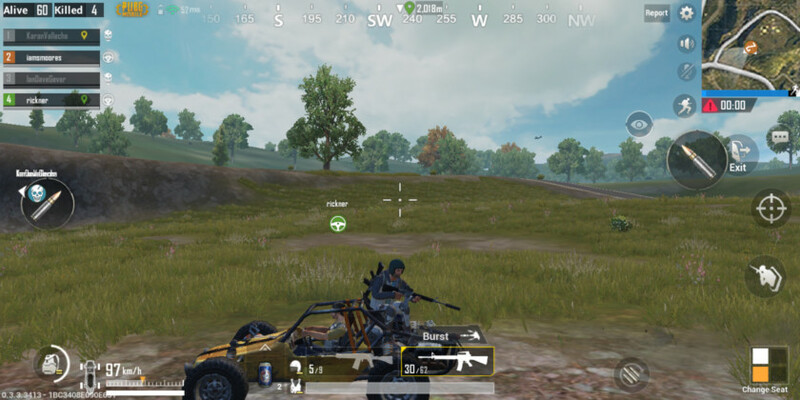 It’s all well and good if PUBG Mobile faithfully recreates the island’s geography and lets you use all the guns and drive all the cars of the original game, but if the controls aren’t up to the task, everything falls apart. To be clear: the controls in PUBG Mobile aren’t as good or accurate as the PC version. Duh. The game uses virtual joysticks for player movement and camera control, and a big button with a bullet on the right will shoot your gun. It’s a little clumsy at first, but actually feels pretty fluid after a few games. It’s a little clumsy at first, but actually feels pretty fluid after a few games. The game offers a few different control options to make everything feel a bit better and get rid of the awkwardness of hunting for buttons you can’t find by feel. A floating shoot button, which moves to wherever your thumb last touched, makes shooting as simple as tapping where your finger already is, rather than having to reorient your hand to reach the spot that fires the gun. Items are automatically picked up, sorted, and equipped in game, which cuts down on some tedious menu management. The game also offers gyroscopic control options, which I’ve never enjoyed, but some swear by. Little touches like automatic item pickup improve playability a lot. Even with those options, the game still feels a little clumsy. That clumsiness actually impacts what kinds of tactics and gameplay are effective. In the PC version, snipers can be pretty dominant. Erangel is a pretty wide open map, there are long stretches of relatively even terrain dotted with hills. Finding a good vantage point to pick people off isn’t hard. The precision of a mouse and keyboard makes this even easier. Fights in PUBG Mobile are more oriented around mid- and close-range engagements. It’s hard to hit people really consistently at a distance in this game. It’s even harder when accounting for bullet drop. Automatic weapons, as well as shotguns, with their wider reticles, seem especially potent here. Driving and shooting is a more viable strategy late in the game. Vehicles often play a larger combat role too. In the PC version of PUBG, vehicles become a liability as the map gets smaller — they’re big, loud, and hard to miss. In PUBG Mobile, they’re actually pretty easy to miss. A fast moving target like a jeep, especially with someone in the passenger seat with a gun, can very easily ride around the perimeter of the circle and pick people off, even near the end of the game. What makes PUBG a pretty good-looking game on PC is more or less missing in the Mobile version. The lighting and particle effects that really sell the game’s look have all been pretty much stripped out, and probably for good reason. Those kinds of elements can be pretty demanding for hardware. The result is a pretty bland-looking recreation. The terrain, characters, and weapons all look more or less the same as the PC version, just with muddier, lower-resolution textures. The game really struggles to run when dropping onto the island. The game ran pretty steady on my LG G6, but it definitely had its fair share of hiccups. I wouldn’t recommend playing on anything much older than that. I tried loading the game on its minimum iOS option, the iPhone 5s, and it crashed before loading the main menu every single time. I’d imagine Android phones of a similar age would struggle just as much. Regular gameplay ran fine most of the time. There were almost always serious frame rate drops when parachuting down to the island, but that’s not totally shocking. It cleared up as soon as I landed, when the game no longer had to render the whole island. The audio is pretty awful. In most versions of PUBG, hearing the direction and volume of noises like gunshots and footsteps is pretty important to learning an enemy’s location. It’s a lot harder to tell this information in the mobile version. Footsteps were especially loud and all sounded pretty much the same to me. Regardless of where they were, once someone was within 15 or 20 feet of me, it all sounded the same. It all sounded bad too. 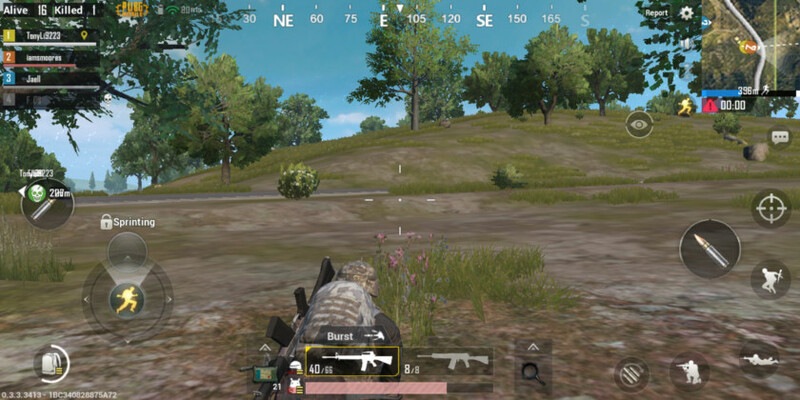 You don’t need to be as calculating to go far in PUBG Mobile. Part of that is due to the inclusion of bots at early levels, which let you get used to the game’s controls without being totally exposed to its normally rather punishing difficulty. Even then, the game’s imprecise controls make for a looser, less tense experience. I think that’s a shame. What really makes PUBG great on PC is the tension of having to methodically make it to the middle of the map as you alternate between cat and mouse, never knowing where the next enemy will pop up. It’s a very different kind of shooter experience than most games, and a lot of that is missing in PUBG Mobile. PUBG Mobile is fun, but it’s not very tense. PUBG Mobile is fun, but it’s not as tense as its PC counterpart. The stakes feel lower, and it misses out on a lot of what makes the PC version of the game so special — In essence, it feels a little hollow. PUBG has gotten numerous updates and improvements since it launched. PUBG Mobile has received a similar treatment with a number of major updates to the game, including the new Sanhok map. You can keep up with the new updates on our official patch notes page. 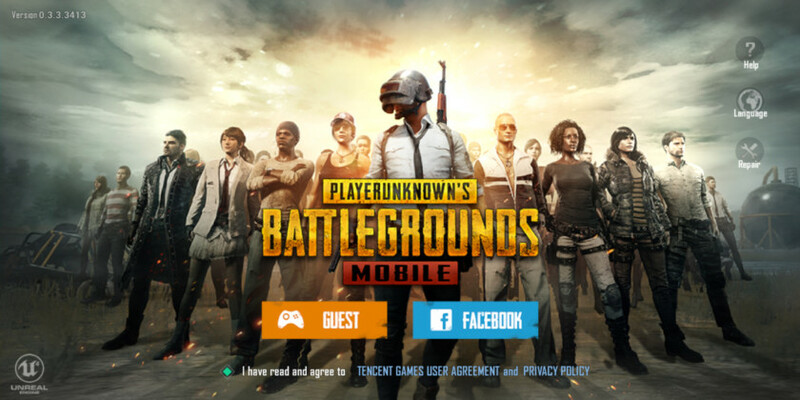 Also, be aware that some markets can download PUBG Mobile Lite, a version of the game that can run on lower-end or older smartphones. If you’re looking for a new mobile shooter, you could do a lot worse than PUBG Mobile. The game is all there, it works, and it’s free. But if you want the same strategic, nail-biting experience of the PC version, you may be a little disappointed. Read Next: PUBG mobile vs Fortnite mobile: Which battle royale wins? What do you think of PUBG Mobile? Let us know your thoughts in the comments, also be sure to check out our PUBG Mobile tips and tricks feature, as well as our PUBG Mobile update tracker. That’s it for our PUBG Mobile review. Looking for more first person shooters for mobile? Be sure to check out our best mobile FPS guide.